LAS VEGAS (AP) — Former heavyweight champion Leon Spinks is in a Las Vegas hospital after a second operation for abdominal problems. The 61-year-old boxer, who catapulted to fame by beating Muhammad Ali in 1978, had the second surgery in recent days after complications from the first emergency surgery, his wife said. "It's going to be a long road ahead, but he's strong and he's starting to recover," Brenda Spinks told The Associated Press. Brenda Spinks said she doesn't know how long her husband will be hospitalized, but that she's optimistic about his recovery. "There were complications after his first surgery, but everything has been fixed," she said. 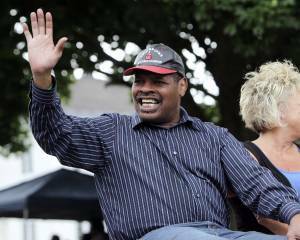 Earlier, singer Tony Orlando sent out a tweet asking people to pray for Spinks, a good friend of his. Orlando wrote that Spinks was "facing the greatest fight of his life." Spinks and younger brother Michael both won Olympic gold medals in 1976 in different weight classes and went on to become heavyweight champions. Leon's rise was meteoric — he got a shot at Ali and the heavyweight title on Feb. 15, 1978, after just seven pro fights. Few in boxing — including Ali — gave Spinks any chance in the fight, but he used his energy and awkward style to frustrate Ali and win a 15-round split decision at the Las Vegas Hilton. But he lost the title back to Ali in their rematch seven months later before more than 60,000 people at the Superdome in New Orleans. "Ali thought I was a wimp and I had to prove to him I wasn't," Spinks said recently. "I knew I could beat him after watching his fights." Spinks would get one more chance at the title in 1981 against Larry Holmes, only to be stopped in the third round. He would never become the heavyweight champion again but fought until 1995, finishing with a career mark of 26-17-3. Spinks was known to mix partying with training, and quickly burned through the big money he made early in his career. He would later move to Nebraska, where he worked as a custodian at a YMCA before moving to Las Vegas in 2011. Spinks, who has slurred his words since his active boxing days, was diagnosed in 2012 with shrinkage in his brain, which doctors said was likely caused by the punches he took during his career. "My brain has got to let me know I'm doing all right and I've got to do things to help my brain now," Spinks said after the diagnosis. Michael Spinks upset Holmes for the heavyweight title in 1985 and fought Mike Tyson in a title showdown three years later. Tyson knocked him out 91 seconds into the fight, and he retired.